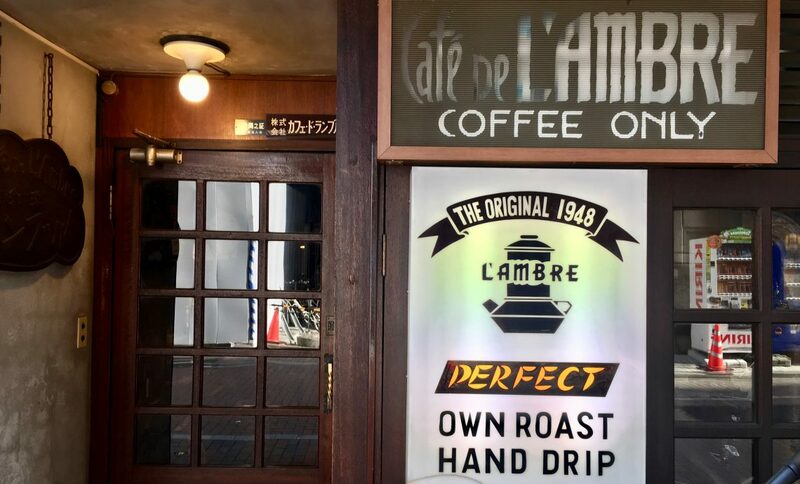 Café de l’Ambre is a speciality coffee shop started in 1948 in Ginza. This cafe only serves coffee, nothing else. It is one of the legendary cafes in Tokyo. Café de l’Ambre is not a traditional kissaten, I actually do not think it fits this category at all. 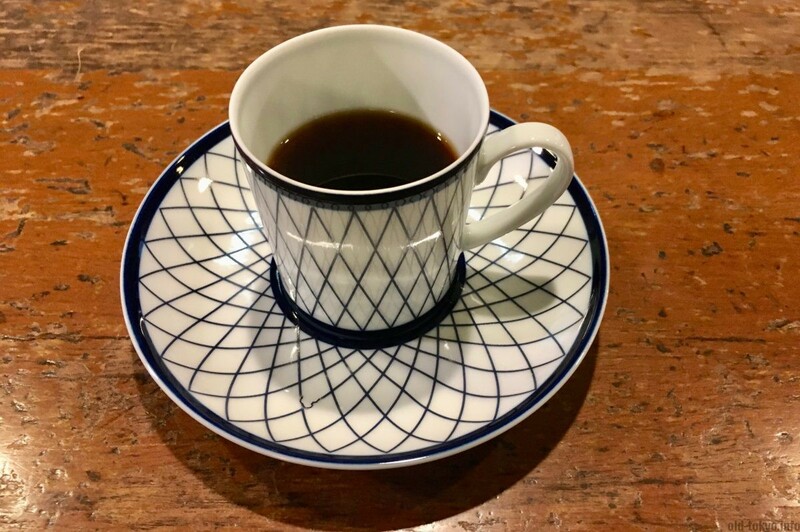 Sekiguchi Ichiro, who established the cafe in 1948, was a coffee freak in pursuit of making the perfect cup of coffee, he kept experimenting and trying out different things to reach his goal. Hence, the focus is solely on coffee at this cafe. Coffee that only goes together with cigarettes. A handful of coffee desserts are also available, such as coffee liqueur pudding and coffee jelly. Mr. Sekiguchi is seen as one of the top 3 coffee masters in Japan (ref. Shimanaka Rou 2008: Guys obsessed with coffee). 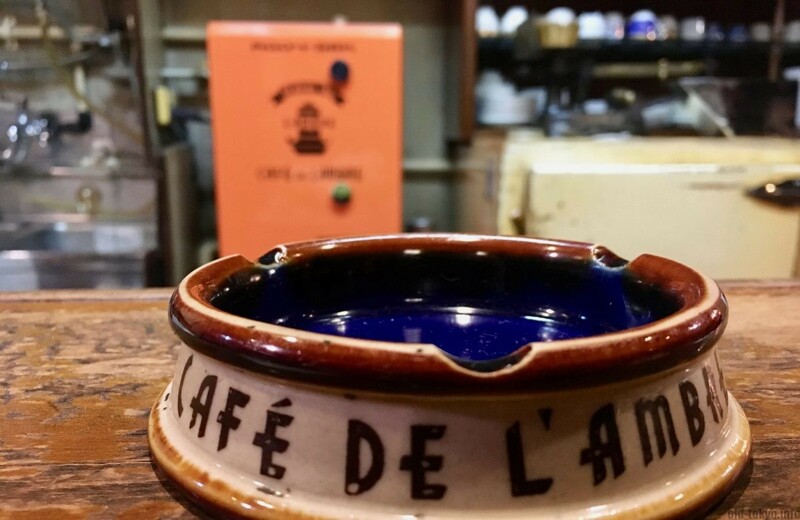 The cafe’s long history and fame brought with it many famous clients such as Kawabata Yasunari (1899-1972), Nagai Kafū (1879-1959) and Mizutani Yaeko (1905-1979) to only name a few. John Lennon and Yoko Ono also stopped by, but as the story is told they could not get a seat as the cafe was full at that time. When I entered the cafe, the large wooden counter caught my eye, with on top their custom made ashtrays. Ordering took quite some time as they have a wide selection of beans from various places and various ages. After my order, the master looked for the right jar of roasted beans, weighed the exact amount necessary on a pretty old looking scale and then ground the beans in a what looked like a custom made orange box (see photo). Next a classic-style red kettle was used to slowly hand-drip the coffee in a metal sauce pan, which was then poured into a beautiful piece of porcelain. There is a choice of blended coffee, straight coffee and a number of original coffees such as L’ambresso (espresso style black coffee). The straight coffee comes with a whole list of choices with location and year. It ranges from Colombian beans from 1954, over Kivu beans from 1982 to Guatemalan beans from 2003. They are categorized by green label, orange label, brown label, black label and gold label. The green label starts from JPY 740 and the gold label will cost around JPY 1000 for one coffee. The shop is rather small with 22 seats, but it seemed the customers (about half Japanese, half foreigners) only stayed for a short time. The interior is a bit eclectic with various art and statues that seemingly do not really go together, in that sense it fits the styling of shōwa-style kissaten. Most importantly though, the coffee tasted great. Mr. Sekiguchi used to be in the cafe until recently. He has passed away at the age of 103 on 14 March 2018 (source).